Whole Foods, the high-end grocer frequently referred to as “Whole Paycheck” by fans and foes alike, has a new owner: Amazon. Amazon will pay $13.7 billion for the grocery chain, the largest purchase the company has made in its history, according to The Wall Street Journal. Whole Foods hasn’t been stellar in the past few years, perhaps a side effect of an intense price competition across the grocery industry. The brand recently announced leadership changes, plans to finally implement a customer-loyalty program and increased efforts to cut costs. 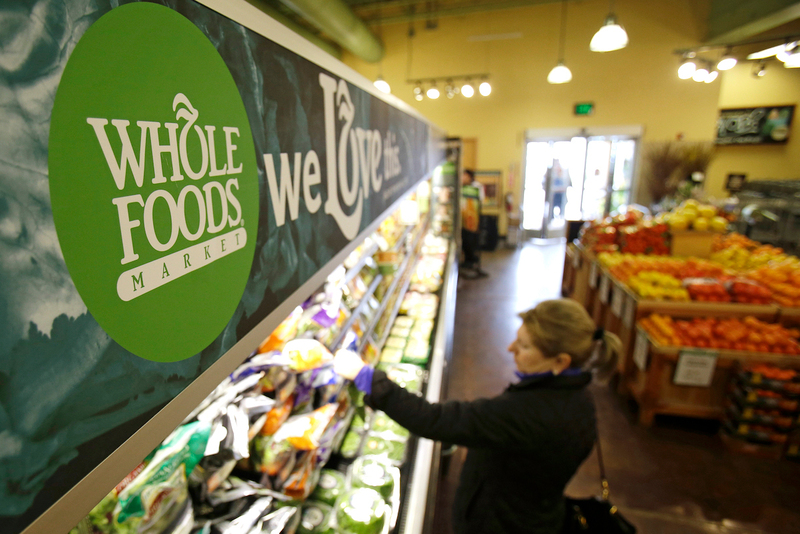 Whole Foods, which has more than 400 locations across the United States, will retain its name. The announcement could throw a wrench in the battle for grocery stores to gain and retain customers. Walmart has been going head-to-head with Amazon, recently initiating two-day shipping on a boatload of items, offering discounts for ship-to-store orders, and even testing a last-mile delivery program. Walmart also bought up Jet.com and online apparel retailers like MooseJaw, Modcloth and, most recently, Bonobos. Meanwhile, Amazon has taken over Shopbop, Audible, Zappos, Twitch and Woot!, among others during its tenure. Amazon founder Jeff Bezos also bought the Washington Post in 2013. Amazon recently announced a discounted Prime membership for people on government assistance, likely a play to attract one of Walmart’s key audiences: low-income populations. It wouldn’t be surprising for the Amazon takeover to mean lower prices for Whole Foods shoppers. The store had recently contemplated pulling back on its regional approach that diversifies product offerings, in exchange for stabilized prices across its stores. When Amazon launched more than 20 years ago as a bookseller, could anyone have predicted its eventual reach? Now, it’s getting harder to tell where Amazon’s reach stops and the rest of your consumer life begins. Amazon Fresh, the company’s grocery-delivery service (a $14.99/month add-on for Prime members), stretches delivery beyond 24-packs of toilet paper to fresh produce, prepared food, and even products from local food brands — essentially absolving you from ever having to set foot in a grocery store. Amazon Prime Now offers two-hour delivery on a variety of gadgets alongside restaurant delivery in more than a dozen cities. Its private-label brands, including AmazonBasics and AmazonElements, are providing serious competition for some mainstay brands, and it’s pushing hard on its apparel sales by launching its own clothing brands — eight so far. But its budding brick-and-mortar operations indicate the company’s willingness to meet customers where they are — just about everywhere. It has seven physical bookstores so far, opening them long after most chain bookstores moved out. It’s testing Amazon Go, a grocery and convenience store that doesn’t have checkout lines — your Amazon mobile app knows what you’ve picked up and when you’re leaving the store. So you can stay home and shop or venture out into the world to spend your cash. Amazon’s ubiquity equals your convenience. Amazon says it won’t lay off Whole Foods employees and doesn’t intend to replace cashiers with automated checkout, but that’s the news today. Next week could be a different story, or next year. It’s not that Amazon is evil for trying to make shopping better, faster or easier. It’s just that Amazon has this way of sneaking into your life that’s hard to shake. Longtime Prime customers have a hard time remembering what shopping was like before two-day shipping was the norm. Calling around to local stores to find the specialty item you need? Those days are gone, replaced by one-click checkout. And those delivery trucks clogging up your local bike lane? You know what they’re filled with. What the average shopper doesn’t know is the risk of Amazon’s growing power. For every new project or innovative idea it presents to the public, the company has dozens more under wraps, getting poked and prodded to near perfection. Amazon has a way of knowing what you want before you want it. And when it gives it to you fast and cheap, it’s hard to imagine wanting anything else.